Christopher Nolan follows up ‘The Dark Knight‘ with a fiendish thriller that’s been 10 years in conception. 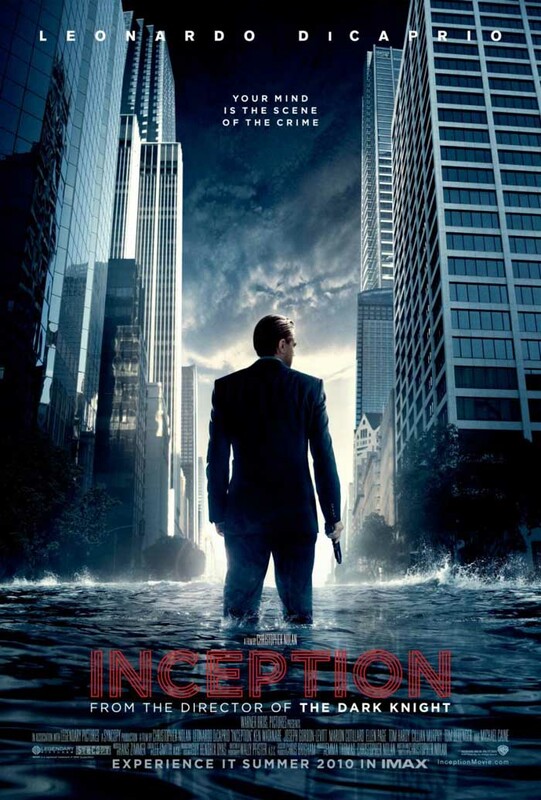 ‘Inception‘ is a film which defies easy summary, although on the surface it bears comparison to other sci-fi thrillers like ‘Minority Report‘ and even ‘The Matrix‘. It has more in common with the ambiguous concerns of Ridley Scott‘s ‘Blade Runner‘ however, throwing the audience headfirst into some pretty deep existential dilemmas. That it manages to do so while being both deliriously entertaining and effortlessly dramatic makes it a truly rare summer blockbuster, one with brains and balls. Leonardo DiCaprio stars as Cobb, head of a team of agents who specialise in infiltrating people’s dreams to unlock secrets from their subconscious. They do this by creating the dreamworlds themselves to reflect their subject and convince them that they are in their own dream, then manipulating it and them in order to try to get at their information. How all this is done technologically is never really touched upon, but the theory of it is explained in enough detail to be convincing. Cobb is in exile from America, where his wife killed herself leaving their two young kids awaiting his return; this situation has left his subconscious an unstable tangle of guilt and grief, which threatens to compromise his work. Slippery corporation boss Ken Watanabe‘s promise of a reprieve from his status (allowing him to return to his family) spurs him on to attempt an unheard of mission; to implant an idea in someone’s dreams, rather than extract it. For this he’ll need more than his usual right-hand man, who is played with a subtle mix of steely reserve and naive charm by Joseph Gordon Levitt. Nolan rounds out the rest of the team with more of today’s best up-and-coming actors: Ellen Page is sympathetic and ballsy as Ariadne, the new recruit entrusted as dream architect; Dileep Rao‘s chemist and sleep-inducer is as dependably flinty as he was in ‘Drag Me To Hell‘; and Tom Hardy brings an insouciant, roguish edge to his scene-stealing turn as the unit’s master of disguise. They all have important parts to play in the action, and it’s not giving anyhting away to say that they all end up in various states of peril, sometimes simultaneously several times over. It’s a film as much in love with building imaginary worlds as it is with blowing them up. Nolan has an obvious passion for architecture and design; the film employs a variety of locations, both in what we understand as its “reality” as well as in the dreamworlds. It’s literally multi-layered, with the characters operating on more than one level of consciousness and existence at almost all times. It quickly becomes dizzying, and as the film delves deeper into levels of constructed subconscious, it can become bewildering; even at two-and-a-half-hours, you won’t get a chance to nip to the toilet. Even when things do get a bit confusing though – Nolan has a habit of wrong-footing you just long enough to keep you on your toes without getting irritated – the film still manages to be surprisingly entertaining. Much of this is thanks to the hugely appealing performances, the main team assisted by the likes of Cillian Murphy and Marion Cotillard in roles that could have been simplistic but are given time and space to develop in order to add a moral complexity and real human drama to the story. Anyone who has seen (and no doubt enjoyed) ‘Memento‘ and ‘The Prestige‘ should take on the challenge this film represents with relish; it is genuinely thrilling in both the ideas it presents its action set-pieces (a Bourne-style chase and zero-gravity fight sequence are especially exciting, and thankfully CGI-free). Others who are merely wanting to see the next film by the director of ‘The Dark Knight‘ may feel lost at sea in minutes; the film throws you in at the deep end and barely stops for breath. For all that though, it is appropriately lucid and does make sense; you just might have to spend some time processing it all afterwards to realise it. That is definitely part of its appeal; by the time it is over you will be emotionally stirred and physically drained, but unable to prevent yourself poring over its puzzle-box intricacy. In order to do that properly, a second viewing is almost mandatory, and for once, fully justified.